Senator Bernie Sanders addresses an event for the birth anniversary of civil rights icon Martin Luther King Jr.
Washington (AFP) - US Secretary of State Mike Pompeo on Thursday warned Venezuela's Nicolas Maduro not to use force against mass demonstrations and urged further international support for the self-declared acting president. A day after the United States and major Latin American nations recognized opposition leader Juan Guaido as the acting president, Pompeo pressed his case at a special meeting of the Organization of American States. "The time for debate is done. The regime of former president Nicolas Maduro is illegitimate," Pompeo said. "His regime is morally bankrupt, it's economically incompetent, and it is profoundly corrupt, and it is undemocratic to the core," he said. Pompeo demanded that the military, whose leadership has confirmed its loyalty to Maduro, protect Guaido, a day after deadly street clashes. "I reiterate our warning about any decision by remnant elements of the Maduro regime to use violence to repress the peaceful democratic transition," Pompeo said. Pompeo urged all members of the Organization of American States to recognize Guaido. The most notable holdout is Mexico, whose new leftist president, Andres Manuel Lopez Obrador, has pledged a foreign policy of non-intervention. "All OAS member states must align themselves with democracy and respect for the rule of law," Pompeo said. His remarks were followed by a protest as Medea Benjamin, the co-founder of peace group Code Pink who frequently disrupts official events, held up a banner that said, "Don't support the coup in Venezuela." Pompeo remained seated, offering a slight smile, as Benjamin was told that the protest was not allowed. Trump has found rare support from the rival Democratic Party over Venezuela, with leading lawmakers agreeing on the need to take action after years of economic and political deterioration in the country. One dissenting voice was Senator Bernie Sanders, the independent who ran for the Democratic presidential nomination in 2016, who warned that the United States had a history of "inappropriately intervening" in Latin America. 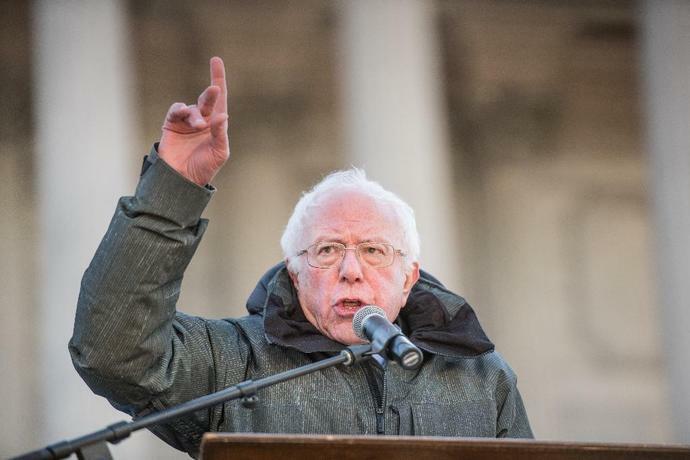 "We must learn the lessons of the past and not be in the business of regime change or supporting coups -- as we have in Chile, Guatemala, Brazil and the Dominican Republic," Sanders said in a statement, while also condemning Venezuela's crackdown on protesters. The United States argues that Maduro's re-election last year was invalid due to widespread irregularities. 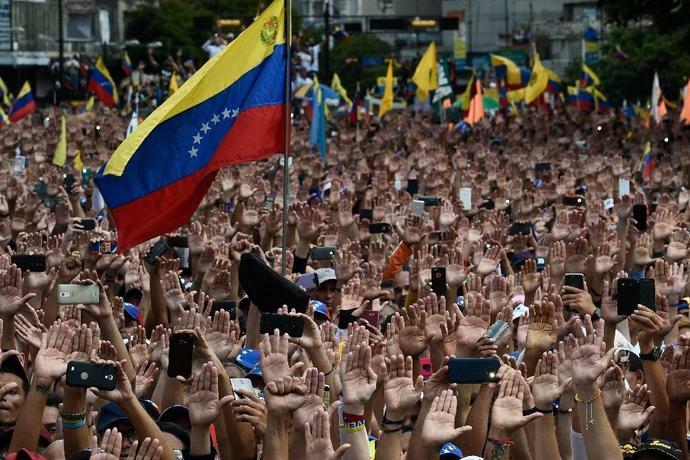 Maduro had declared the National Assembly, led by Guaido's opposition, to be illegitimate. Pompeo also announced $20 million in humanitarian assistance for Venezuela "as soon as logistically possible" in response to what he said was a request from the National Assembly. Venezuela has suffered hyperinflation and scarcities of basic food and medicine amid an economic crisis in which millions have fled the country. Oil prices rallied by more than 2 percent on Monday to levels not seen since November 2018 as a Reuters source familiar with the matter confirmed a report that Washington is set to announce all imports of Iranian oil must end or be subject to sanctions. U.S. West Texas Intermediate (WTI) crude futures rose to a Nov. 2018 high of $65.39 per barrel, up 2.2 percent from their last close. News that the United States is preparing to announce on Monday that all buyers of Iranian oil will have to end their imports shortly, or be subject to U.S. sanctions, was first reported on Sunday by Washington Post foreign policy and national security columnist Josh Rogin. "We never expected anything logical from Bolton, but as national security adviser, he should at least know the context of dialogue that took place between the two leaders regarding a third summit before he says anything," North Korea's Foreign Ministry diplomat Choi Sun Hee was quoted by the news agency as saying.